baby chick claws around our hearts! We took her home and bedded her down in a cardboard box in our large central hallway. We put in some shredded paper for her to try to make into a bed, and a small container of water. The pet shop people had advised us on what to feed her, by memory I think it was special pellets. Then we just sat there on the floor admiring her, and trying to decide what to call her. At last it hit us! KFC! 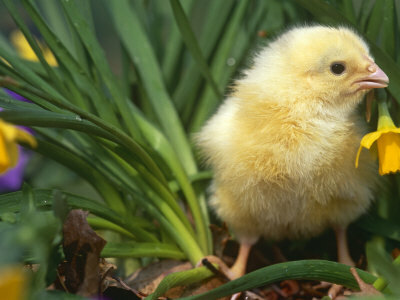 A perfect name for a perfect little chick. At the time we were taking weekend trips down to our beachhouse, so it was only natural that we would take KFC with us! She was just a baby and needed our attention. KFC would sit in her box on the backseat with Maddie, and all 4 of us would head off. Night-time on a Saturday night there, usually meant that after dinner we would head downstairs to watch a video we had hired. So settling ourselves on the couch, there would be me, Maddie squeezed in next to me, so that she could hold and rub my hair--her sleepy thing, and Chris, with KFC on his shoulder. She would snuggle into Chris' neck and doze, sometimes having little accidents on his shirt, but we just cleaned him off. She was KFC and our baby! This went on for a few weeks, and then KFC started to 'chicken-fy'--she grew longer legs, and her lovely yellow fuzz was turning into a rich brownish coating of feathers. Our girl was beginning to grow up! She graduated from her box to a largish wire cage which I had used at one stage for a pet cockatoo. She still lived in our hallway, but as she was getting older she wasn't quite so convenient for travelling. While we still loved holding her and cuddling her, it was a new stage of development for her and us! As time passed she graduated to living outside in a bird aviary that we had. After we decided that we liked the idea of having more chickens, Chris built a chicken yard, and KFC's aviary became a refuge from the weather for the newly arrived chickens if they ever needed it...it was in there that they laid their eggs. KFC, being the first chicken, obviously was boss, and she taught the other fledglings how this world worked--of course she was very partial to us--she was our first born chick! At the time Jock was our only Border Collie, and he and KFC were fairly good friends. Each morning as either Maddie or Chris emptied the 'chook' dish into the chook house, (a combination of vegetable scrapings and scraps from the meal on the previous night), Jock would stand guard as the eggs were gathered, and then nodding to KFC, he would leave the pen with his majestic tail in the air. What attitude! Life continued this way for a while, until it was discovered that I needed surgery for a fairly serious condition, followed by a long recovery at home. During the recovery period, I would often walk outside in the back garden to get some sun, and to talk to the 'girls'. It was at this point that I noticed that KFC wasn't her usual self. She often sat by herself on the ground, and just seemed quiet--not her usual behaviour. For a few days I would wander into the chook yard and just sit with KFC, rubbing her tummy and urging her to lift her head and walk around. For a while she would do just that, but eventually she would just lay down again. I remember spending a lot of time with her, and talking to the other 'girls' as I did so, explaining that they needed to take care with KFC, and to nurture her. When I held KFC in my lap, while sitting on the ground in the chook yard, she would be so happy, and try so hard to be her old self, but I knew that when I left, she would just lay down again. Unfortunately the day arrived when KFC just didn't wake up, or try to move..she just quietly died. The other chooks looked at her, but didn't bother her or go near her--I like to think that they too were sad at her loss. We buried KFC in a small plot on the far side of our driveway. Somehow, even though I enjoyed our other chooks, and even taught Red how to climb a small ladder of branches I had put in the wire mesh of the chook yard, and then taught her to jump off the highest branch, which was a great trick--it wasn't the same as having KFC greet us everyday...some pets are very noticeable in their absence. That was KFC!